Baby Beach, Aruba, Dutch Caribbean. Swimming Conditions: Good. Calm waters are less than five feet deep. Baby Beach is located at the southernmost point of Aruba, in an area once known as “The Colony”, an old gated community where executives of the Lago Refinery used to live with their families when the refinery was still operational. It should be no surprise that it is one of the top choices on our list of best beaches of Aruba. Reviewed by many, this tranquil cove outside San Nicolas got its name from the fact that its calm waters are less than five feet (1,5 meters) deep. 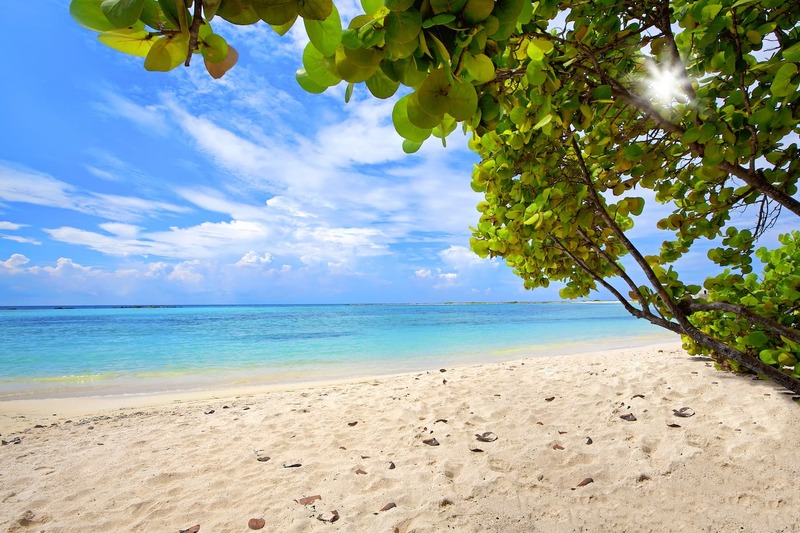 The beach looks like a perfect natural lagoon and it is protected from the big blue waters of the Caribbean Sea. Baby Beach is a great place to spend time with your (small) children to teach them how to snorkel or swim. The lagoon is surrounded by approximately 600 meters of beach. The beach is calm and it slopes very gradually into the water. The water level for most of the cove is not more than about waist high, but towards the inlet, it deepens to over 5 feet. Because Baby Beach Aruba is far away from the hotels and for example Palm Beach it’s a relatively quiet place to visit and enjoy the sun, the white sand, and the crystal clear shallow waters. Together with Rodgers Beach (to the north), these are the only major beaches south of San Nicolas, Aruba’s second major city. Baby Beach is a favorite spot for the local people to visit with their kids, especially during the weekends – the beach can get a little bit crowded then. The best time to visit is early in the morning on a weekday. Don’t forget to pack a bag with some essentials like sun lotion, sunglasses and water and perhaps some food. During the weekends there’s a chance to enjoy some local food. There’s a snack bar in the area of the beaches too. 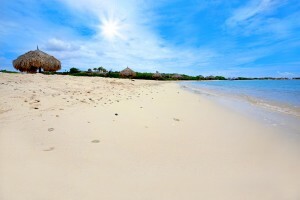 Enjoy your stay at Baby Beach, one of Aruba’s finest beaches to visit! Snorkeling at Baby Beach is quite the experience, especially for beginners and first-time snorkelers. The warm waters at Baby Beach are shallow a long way out, and visibility is usually good. You should be able to see the sandy bottom about 9 feet down without a problem. As soon as you’re in the water from the shore with your snorkeling gear, you’ll find a whole new underwater world to explore. Its beauty will grab you as from the moment you start your snorkeling adventure. You’ll quickly spot all kinds of fish, such as the yellowtail grouper, butterfly fish, blue-headed wrasse, and barracuda. You’ll likely spot some schools of baby squid and sea horses as well. You may want to bring some bread or crackers to feed the fish, but be prepared for a tropical fish frenzy! If you swim to where the lagoon opens out to the Caribbean Sea, you’ll spot more coral and even more and bigger tropical fish. Be very careful, because, outside the lagoon, snorkeling at the Baby Beach Reef can be very dangerous. The currents can get really strong, don’t get caught off guard. The waves will be much larger here due to the easterly trade winds. Also, keep an eye out for any kitesurfers. So if you’re a beginner, just stay inside the lagoon. Baby Beach, and the south coast of Aruba in general, has some of the best scuba diving spots on the entire island. Here you’ll find coral reefs, artificial reefs, the Cabez Reef and tons of tropical fish. Top diving spots include Air Aruba’s old YS-11 airplane and the Jane Sea wreck. If you’d like to go scuba diving, you can arrange it at the JADS Dive Center, located at the west side of Baby Beach, right next to the Rum Reef bar. At JADS, professionally PADI trained instructors cater to people of all diving levels. You can choose from introduction dives, open water courses to complete dive master certification. Diving is possible both on the shore or from a custom-made dive boat. The dive shop offers a large range of diving and snorkel equipment, digital underwater cameras, and t-shirts. Snorkeling gear is also available for rent at the JADS Dive Center. Renting a mask, fins, and snorkel costs about $10.00. There are no hotels on Baby Beach, but if you’d like to stay nearby, there’s a nice beachfront holiday home just a mile away. From the airport, it will take you about 20 minutes to reach by car. The beachfront home is family-friendly and sleeps up to 6 persons. It offers direct access to a private beach area, with fantastic views over St. Nicolaasbaai and Colorado Point (Punta Basora). Outdoor facilities include a patio, BBQ facilities, a garden and a sun terrace. Free private parking is available. The home is air-conditioned and has a large living and dining area. The kitchen comes fully equipped with a coffee machine, dishwasher and dining table. The family-friendly home features 3 bedrooms and 3 bathrooms. Several bars, restaurants, and a supermarket are just a few minutes away by car. Rodgers Beach is less than a mile away. Shops are a little bit further away in San Nicolas. There’s a luxury ocean view villa right along the road to Rodgers Beach and Baby Beach. It’s a spacious beachfront villa with an outdoor pool and private deck with fantastic ocean views. 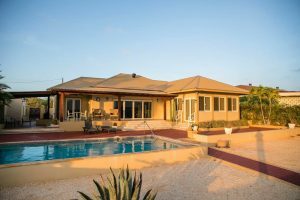 This 4-bedroom beachfront villa is excellent for groups or families with kids who all would like to stay in a secure house right by the beach. Every room is private, and features a comfortable bed. The kitchen is fully equipped with a microwave and a toaster, if you want to stay in and cook yourself. There’s a Mini Mart right across the street where you can stock up on groceries and other basic needs. Kids will love the outdoor pool, and there’s a superb poolside terrace with plenty of shade and deck chairs. If you and your friends or family would like to have dinner outside, there’s plenty of dining space and BBQ facilties as well. If you’ve arranged a rental car, just park it at the private parking right in front of the villa. If you’d like to explore the island by public transportation, just hop on the bus at the Baby Beach Arubus Stop! The property’s managers are known to be very friendly, professional, and quick to respond to any questions you may have. A professional staff will be ready to help you cook, clean, shop and drive you around the island. It’s best to reach Baby Beach by car or some other vehicle. From Oranjestad, make sure you enter Lloyd G. Smith Blvd and follow directions south to Queen Beatrix airport, then Savaneta and eventually to San Nicolas South. Continue following directions to Colorado Point (Punta Basora). From here-on continue to drive further south to the beach. From the hotel zone, the trip to Baby Beach should take you about 30 minutes. Visiting the beach is also possible by public transport. At the Hotel Zone, directions to the beach are fairly straightforward. Hop on the right Arubus and step off at the Baby Beach Arubus bus stop and just follow directions to the beach.